To start off with, I layered three pieces of Share What You Love Designer Series Paper on a Whisper White card base. I stamped the typewriter in Tuxedo Black Memento Ink Pad on Crumb Cake Cardstock. The mini hearts were stamped used my Rich Razzleberry Classic Stampin’ Pad (each heart was one “stamped off” once), and I used my Old Olive Classic Stampin’ Pad with the “grunge” stamp (also “stamped off” once) to create a subtle background for the keyboard. I added some speckling with Early Espresso ink, tore one edge of the paper, distressed it a bit, and adhere it with a few Stampin’ Dimensionals. 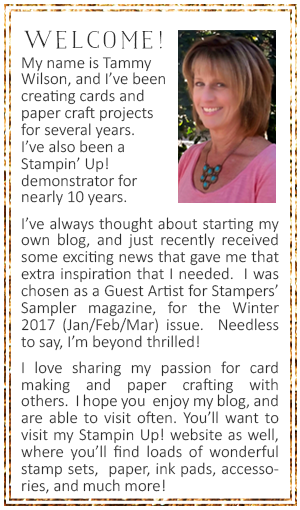 The sentiment was heat-embossed using Gold Stampin’ Emboss Powder and a Versamark Pad. After I cut it out, I adhere it with a couple of Mini Stampin’ Dimensionals. Tucked underneath the typewriter are bits of Rich Razzleberry Velvet Ribbon, Whisper White Polka Tulle Ribbon, and a Linen Thread bow. For my little touch of bling, I added a few Basic Adhesive-Backed Sequins.